Cardinal Dolan greets college students at Rockland Community College’s Student Union building in Suffern Feb. 28. The cardinal leads a prayer during the blessing of the Rockland Community College Food Cupboard. Students representing about 20 colleges listened to a 30-minute talk by Cardinal Dolan before he answered their questions at Rockland Community College’s Student Union building in Suffern Feb. 28. Cardinal Dolan discussed the Church’s clergy abuse scandal during his talk in front of 180 people sponsored by the archdiocese’s University Apostolate. The cardinal said people are shocked and scandalized by what has happened, and some have left the Church. 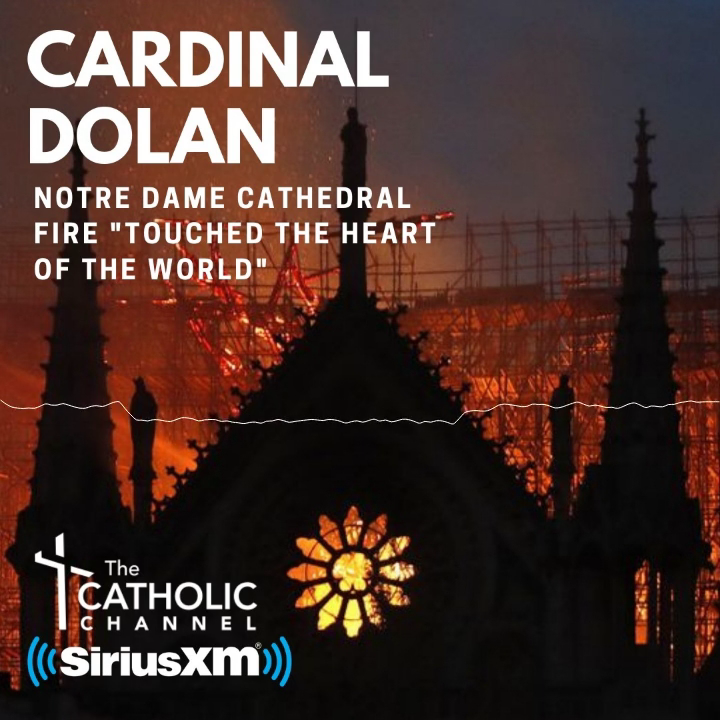 Cardinal Dolan added people want Christ without a Church, which is not possible because Christ and the Church are one. “The Church is the spotless bride of Christ,” Cardinal Dolan said. “Jesus never lets his bride down. We often let Jesus, our groom, down. You must remember, everybody, the Church is always the spotless, luminous, radiant bride of Christ. We are not spotless. We are sinners, including popes, cardinals, bishops, priests, deacons, nuns and all members of the Church. Sarah Confeiteiro, a parishioner of St. Anthony’s in Yonkers, said it was important for the cardinal to address the issue. “The way he talked about it really exemplified how not everyone is bad. There is good and bad in every situation,” said Ms. Confeiteiro, a junior at Mount St. Mary College in Newburgh. Following his discussion, Cardinal Dolan answered questions written by the students before the talk. The first question addressed the conversion of heart in regard to abortion. “He said you do have to focus on the conversion of self as well as conversion for others, especially around the issue of abortion. He pointed out charity is so important in that issue,” said Theresa Vogel, a junior at St. John’s University and a parishioner of St. Thomas the Apostle in West Hempstead. Before his talk, Cardinal Dolan visited and blessed the Rockland Community College Food Cupboard in the Student Union building. The cupboard was started 35 years to assist students and their families who are in need of food. “If I have the time, what better way to spend it than helping people?” said Christina Willems, one of the Rockland Community College student volunteers in the pantry. Her family worships at Sacred Heart parish in Suffern. Cardinal Dolan was greeted by students as he entered the room for his talk and was welcomed by Rockland Community College President Dr. Michael A. Baston. Retired Auxiliary Bishop Dominick Lagonegro led evening prayer before Cardinal Dolan started speaking. “I came (to his talk in November 2017 at the Culinary Institute of America) and wanted to see what he said now with everything going on with the Church,” said Jessica Kovach, a junior at Mount St. Mary and parishioner of Our Lady of the Blessed Sacrament in Bayside, Queens.